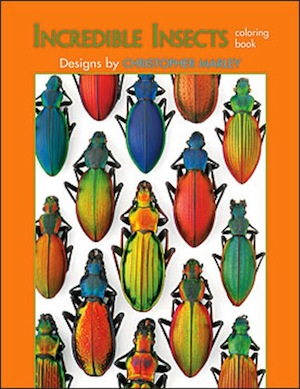 Pomegranate’s Incredible Insects coloring book features 22 designs based on the stunning original artwork of Christopher Marley. Coloring pages are blank on the back so they can be cut out and displayed. 48 pages. Dimensions: 8.5" x 11". The last page of this book is blank so that you can draw and color your own insect picture. Perhaps it will be one you have seen in your neighborhood or in your school yard. Or it may be a fantastic creature that crawls or flies out of your vivid imagination!